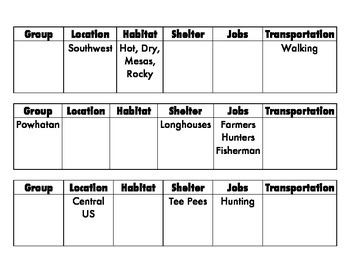 Included are three pages of scaffolded practice on sorting the three Native American groups specified by Virginia SOLs for second grade (Powhatan, Lakota,and Pueblo). The first page has three of the boxes on the grid filled in. The second page has two boxes filled in. The third page has only one box filled in.